You are an artist. One of the first things you need to do before you're successful is to own this statement. Proclaim it and make it feel genuine. Say it out loud: I AM AN ARTIST! Trust me, I know this can be both liberating and terrifying. I'm a B I G believer in not running my business from a place of fear, but rather from a place of positivity and abundance. And in a flourishing art practice, there's no room for fear or doubt. Let's look at the difference between a 'starving artist's mindset' and a 'flourishing artist's mindset', because a vital part of your success will be due to this concept, alone. Starving Artist vs. Flourishing Artist: A starving artist believes that doing what they love will mean struggling financially. A flourishing artist believes in abundance and is excited by all the possibilities their art brings them. Fear that my artwork isn't good enough. Fear that my artwork will get stolen. Fear that I won't make any money from it. I'm not a business person. I'm too old / too young. I didn't go to art school so I don't know what I'm doing. Suffering will make me a better artist. I can learn anything that I set my mind to. There's room for me in the market, and I have something unique to share. Promoting myself and learning how to market my work allows me to do what I love. I love sharing my process and my work with the world. My skillset allows me to explore so many different opportunities. Being a flourishing artist means learning how to promote yourself, how to market your work and how to run a business. It requires a lot of work but can give you one of the most fulfilling careers possible. Inside Flourish, I pull back the curtain on my business as a surface pattern designer and how you all the working gears on how I've built my business. If you have dreamed of crafting a career that you love, I would love to have you join me inside the Flourish Membership. Are you ready to flourish? Learn More & Enroll HERE. Enrollment for the Flourish Membership closes tonight, Tuesday October 30th at 9pm EST. It won't be opening again for 6 months. I hope you'll join us! Hello, September! This last month has been filled with adventures and new experiences. We are back home from our month long road trip in Miss Marjorie, my oldest has started school and both of my children are celebrating birthdays this week. As I welcome this new month, I'm embracing a new routine, new ages and the beginning of a new season. The print used in this month's calendar collection is called 'Unruly Terrace Earth' from my new fabric collection, Gathered for Art Gallery Fabrics. All New: The Gathered Fabrics Lookbook! Today I'm proud to announce the release of the new Gathered Fabrics Lookbook! It's filled with over 60 pages of projects, patterns and inspiration. To celebrate the launch I thought it would be fun to share a few of the questions and answers from a recent interview with Art Gallery Fabrics over the collection. Read the full interview inside the Lookbook! AGF Q: Hi there, Bonnie! Congratulations on releasing your latest fabric collection, Gathered! We understand you drew a lot of inspiration from gardening. 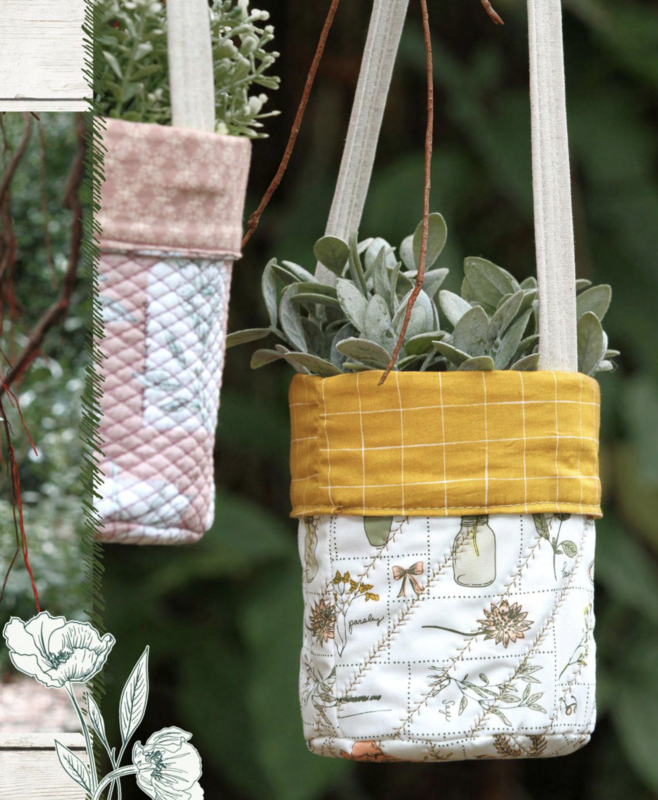 Can you elaborate on how this green thumb inspiration translated into fabric prints? A: Thank you! You’re right, I love to garden and couldn’t help but let it shine through in this collection. The garden is the heart of our home, and a place where I love to spend time. It’s a quiet place where I can go to renew my mind, but also a place where I my children can be fully intwined. They help me plan the garden, start and transplant seedlings, pick flowers and harvest the veggies. I always let them choose their favorites and I love seeing the wonder in their eyes as they watch everything grow! Plus there’s something extra special about grabbing a snack straight from the garden. It’s for all these reason that I love digging in the dirt, and wanted to incorporate it into this collection. Q: There’s a quote from Impressionist Claude Monet found on two different prints! How did his words make their way into this collection? A: This quote, “I must have flowers, always and always” has always sat well with me. It’s not only lovely, but it’s been true for me nearly my entire life. My mother grew flowers for me by request when I was a little girl, and I can remember being the only one in school that kept flowers at my desk. Today, I grow them so that I can keep vases of fresh flowers by my work desk. I think it’s the best way to breathe life into a room! Q: What would you love to see makers sew with Gathered? A: I will never tire of seeing what beautiful things talented makers create with my designs. I suppose my favorites are alway the ones that mark milestones or might be kept as heirlooms. Quilts for loved ones, swaddles for young ones and the special things that we make and cherish for ourselves. I hope you'll find that this collection is, as well. Whether you share my same passions or have your own, I wish you more of whatever you love to gather, or more time with whoever you love to gather with. Looking to purchase? Gathered started shipping to stores all over the world just this week. Shop one of the Online Retailers or see if your nearest independent quilt or fabric shop is currently stocked with it. Shop the full collection online now at the Fat Quarter Shop and Hawthorne Threads. Using Gathered? Share your projects by using the hashtag #AGFGathered on Instagram! Hello, August! I've been looking forward to this month for a long time, because I knew we would be on the road! We're currently in the middle of month long road trip and I'm writing you from southern Wyoming. It's so beautiful! AGF's Q: In your print titled “Simple Living,” how did you narrow down all the elements used in it? A: To me, simple living means that life goes by more slowly because we’re living it with intention. The icons that made their way into this print all represent things that inspire us to live more simply - growing our own food, flowers and herbs, reading and sewing. A few of my favorite ways to live slowly, like sipping on tea with honey, made their way into this print as well! What are a few of your favorite ways to live simply? Ever since we got married, David and I have dreamed of owning an Airstream. For 10 years, we casually looked at them, sometimes more serious than others. This spring we decided it was the right time for our family to do some traveling, so we went on a mission: to find an older Airstream that had already been updated (we weren't quite up for a full renovation), but something that I could make our own. On Easter weekend, we found the perfect match. A 1962 26' Airstream Overlander. The previous owner had done a complete shell-off restoration, so it already had new axles, updated plumbing and electrical, new cabinetry and several improvements. She was the perfect blank slate! We scooped her up, and while looking through the original paperwork, found that a Miss Marjorie was the original owner and had bought her in 1962. So in honor of her beginnings, we decided to name her Marjorie. The kitchen is delightfully functional and as long as we have water hook-ups, I've been able to cook regular meals in it every night. We were hoping to use the original stove, but after finding a small gas leak decided to replace it. Though I loved the original, I'm so thrilled with the new oven - it's a dream to cook on! The tiny backsplash is perhaps my favorite addition. I think I did more research on flexible grout than I have on anything before. We ended up using Tec AccuColor Unsanded Grout mixed with Tec Acrylic Grout Additive for increase flexibility, and so far so great. There are two potential places to sleep in Miss Marjorie, one is where the table is, but our favorite is where the two sofas are. I installed a small ledge right beneath the cushion and had a piece of wood cut to match it's size. It lives underneath one of the cushions and at night, we slide it out to make a bed. The back cushions fit side by side on top of the wood to make it a complete king size bed! I had the cushions recovered in a rich green velvet-like fabric that makes the space feel so luxurious. As a surface pattern designer, I also wanted to give a nod to the father of surface design himself by using a William Morris wallpaper. I find it so inspiring! I also worked one-on-one with Worley's Lighting for all of the lights in the Airstream. After working with Shelli on some of the lights for our home, I knew she was my 'go-to gal' for the Airstream. She made a few of the backplates and light lengths custom to fit the space just right. I believe that 26' Airstream is the shortest camper that comes with a full bathroom, and it's possibly my favorite part! Aside from being incredibly functional and helpful, I love that it's in the back of the camper (many are in the middle, now). The curved roof makes for some interesting decorating and cabinetry, but with two small closets it has ample room for storage and clothes. After falling in love with the tile in this bathroom, I wanted to use a variated pennytile with dark grout for a similar look (on a miniature scale!). I ordered no less than 12 samples of variated penny tile before I found the perfect one, and I love how it makes it almost look like the inside of a jewel box! The little dining space is where we spend most of our time, and it's both functional and comfortable. Though the table does fold down to make a bed, we have found that we prefer to sleep in the sofa area and leave the table in tact. It's where we eat and work, and the kids play and draw! Overall, I couldn't be happier with the end result and how it flows with our family needs. I loved designing such a tiny space, the littlest things can make the biggest impact! Hello, July! Whew, summer is already flying by. We’ve been busy working on projects for the upcoming lookbook for my new fabric collection, Gathered for Art Gallery Fabrics, and I can't wait to show you more! This month's calendar is inspired by one of the prints, and it has begun arriving in stores worldwide! We're also gearing up to take off on a cross-country camping trip later this month and I'm excited to explore with my family. I love re-discovering the world through my children's eyes! It is with much anticipation and great delight that I get to announce the release of my newest fabric collection for Art Gallery Fabrics: Gathered! Gathered was inspired by finding joy in the simplest things. Gathering food from the garden on a summer day, gathering wild flowers along the roadside and best of all, gathering with the ones we love most. I hope it will inspire you to savor the small things, live a simpler life and cherish all the moments you have with your loved ones. As I began dreaming up this collection, I pulled straight from my heart and the simple things that bring me the most joy. Growing flowers and food has always been a passion of mine, and now that I get to do it with my littles it's even more so. I find that connecting with the earth in this way, picking flowers that we've grown and eating food directly from the seeds we've sown, is endlessly inspiring.